In the immediate post-war period, Lincoln updated the Continental with new trim including a much more elobaorate front grill and bumper. It kept the model’s L-head V12 engine which produced 130 bhp. The model was sold up until in 1948 when Ford launched the Continental brand as a separate division with the Mark II. 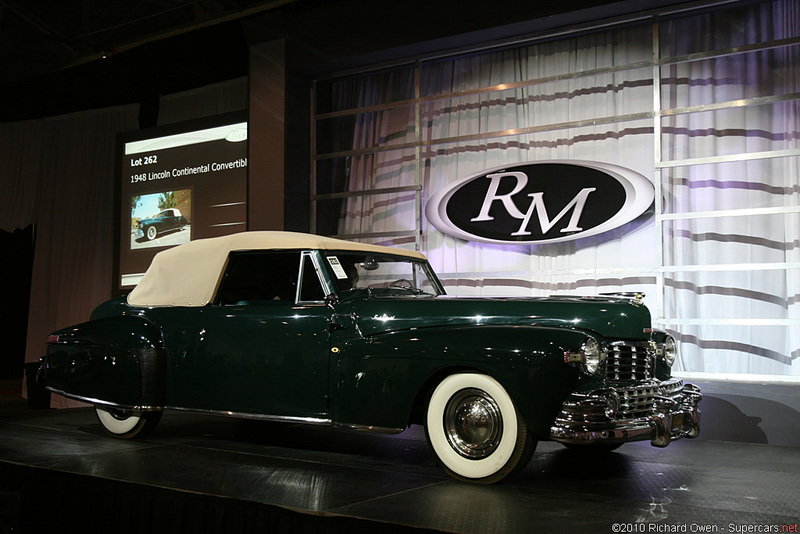 1946 Lincoln Continental Cabriolet – sold for $56,100. This outstanding Continental is one of only 201 cabriolets constructed in 1946 and one of considerably fewer that remain in existence today. Though much of this car’s history is unknown, it is apparent that by 1976 the car had come into the care of Alan Berg of Wyncote, Pennsylvania. Within a year of his purchase, Mr. Berg set about an extensive restoration conducted by The Restoration Shop of Jamesburg, New Jersey. Sourcing correct NOS parts from known marque specialists such as Vintage Auto Warehouse in Frederick, Maryland, and Lincoln Services, Ltd. in Pennsylvania, the artisans at The Restoration Shop were able to refurbish this Continental to its majestic original condition. 1946 Lincoln Continental Indy 500 Pace Car – sold for $104,500. Although this is not the only Continental claimed to be the ’46 pace car, this is the only one recently used by the Indianapolis Motor Speedway and driven by former CEO Tony George in 2005 during the race festivities. Longtime Indy 500 announcer Tom Carnegie was driven by George in this car in a gathering of pace cars prior to the running of the 2005 race. Carnegie, whose voice is synonymous with the historic race, first served as public address announcer in 1946, the same year the Continental paced the race.